I will be bringing mika, I dont think i can bring any of my macaws either as they are quite hormonal at the min. Bec isnt going to her Dads next weekend so I am not time restricted so I think we will be able to make it. Also i've been helping a guy in the Wirral with his grey and he is a little isolated but is just off the M53 so I may drag him along to meet some people and talk parrot stuff. I have a big travel cage Vinnie can go in... although she looks a raggy little thing at the moment :(but I suppose thats what its all about? What do you think? Sounds good Kate. Tell him where it is. where is he? Gym starts at 9.00am, and finishes at 1.00pm, there are 4 classes of mine, 4 classes of the sportshall gym running at the same time, swimming lessons on, the building is open so there are a lot of people coming and going ast the area the birdie will be in! Oh and there is a train station just outside, a beach, shops, buses......anyone bringing kids let me know and I'll tell you what there is to occupy them for a while! why is everything happening on the 23rd! You al have your show, it'll be Tuppence's 1st hatch day and there is a talk going on in London I reallly wanted to go to but i'm not gonna get there by the looks of it as mum and step-dad want a lift to their friends - they don't ask for anything very often..almost never in fact but they would like a lift to meet up with some friends so they're coming top of the list for me next weekend. From here its approx 195 miles and 5hrs drive, so cannot come. Apart from a long way would not leave parrots & dog on their own all that time. Also its hubbys at the college for Archaeology day school and our local animal rescue have their Christmas Fayre. So yep, everything happening on the same day anyway. But those that go enjoy, and please post up piccys so we can see what we missed. Oooo is your hubby into archaeology Di? I'm bringing the lovely lola and the very voracious venus! Really looking forward to seeing everyone, and the birdies, and the kiddiwinks as well. I'm starting to get excited:D I love birdie days! 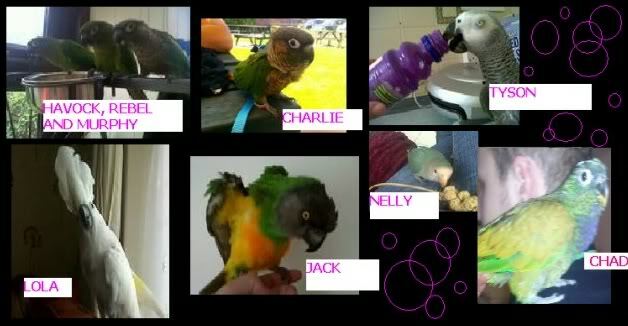 How would Problem Parrots like the donation from the kids paid? Hollie are you bringing any kids? One's with skin and not feathers? Lily can do gym with the big ones if she wants. I'll sort it out for you, swimming is for 8 years and over, so Kate, don't know how old your's is, swimming stuff ay relieve a bit of boredom. Ooo I'm getting so excited, just heard Kai and Aries' friend Tats is coming too. My Three Grey Ladies, love 'em. What a trio Sue! Hope they all sing at the same time!! Aries can whistle with Tats (and louder but not as tuneful), Kai and Tats sing together, they're so cute. geuss who has turned up so he can come along Summer so i think thats 3 im bringing . ive got the harness ready to bring with me for you sue.